I should think most people know that I don’t go to India for the food… I suppose I don’t go anywhere in the world to enjoy food, – well Italy might be a possible exception. In India I mostly survive on butter naan, rice, the odd soup and Western food chains. 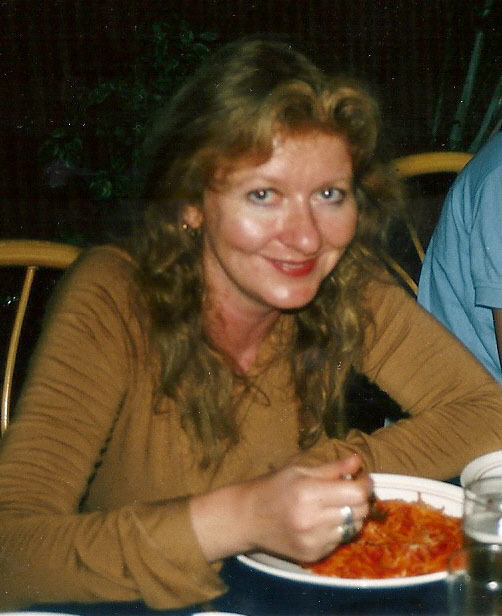 I came to India for the first time in 2002, we flew to Panaji (state of Goa) and we were staying at the Hotel Majestic – in the middle of nowhere really. The hotel was new, it was not a very interesting place to be (booked by Asbjørn’s project I believe), but very modern and pleasant with its kidney shaped pool! There was a big dining room on the first floor, and every meal was included in the price. Of course I didn’t dear to try any of the many dishes lined up on the buffet. But I made one very important discovery; the naan bread. And the butter naan bread in particular! And of course, there is always the rice when the going gets tough…. It didn’t take many days before people around me tired of the same food every day. Also, the food was exceptionally spicy. 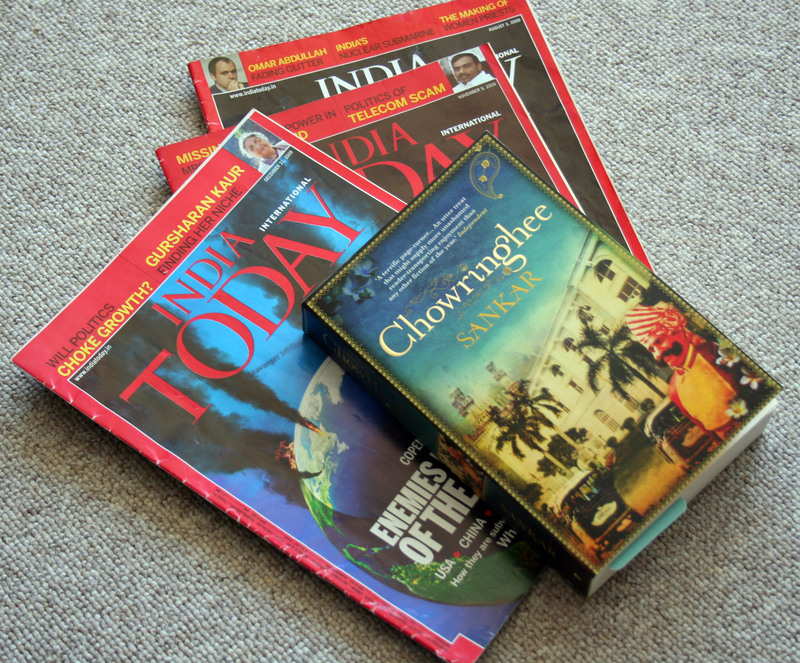 I stuck to my choice…. After almost a week, we suddenly found there was some kind of a restaurant downstairs, I guess we had written it off as a bar, simply. But since there were some entertainment going on one evening, we sat down by a table and discovered a menu. A MENU. We hadn’t seen one for a whole week, and what’s more: Here we had pasta, and nothing less than Spaghetti Napolitana; spaghetti with plain tomatoe sauce. I don’t know if it was the absence of Western food or the chef or what, but it tasted delicious! Simply HAPPY, eating Spaghetti Napolitana at the Hotel Majestic! Naan bread is in fact very simple food; yeast, water, egg, yoghurt, flour… I often wonder what makes it so good and tasty, the ingredients don’t count for gourmet food. But I guess it is the Tandoor oven that does the trick. Soft and crisp at the same time, butter spread all over. There’s only one word; Yummy! The most unhealthy, the butter naan, is definately the best one. Garlic nan, uhhmm, for those who like garlic a lot. In my opinion, not a must. I have tried naan bread in Norway, but I don’t anymore. 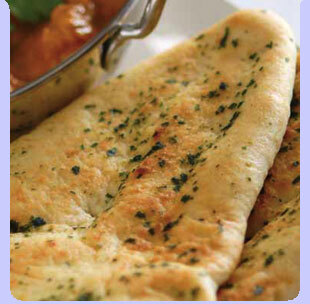 The naan bread always tastes fantastic in India – so why go for a lesser experience at home! It proved difficult to find a perfect and ultimate photo of a naan bread on the internet, so I have made a mental note about to take one myself later this year! 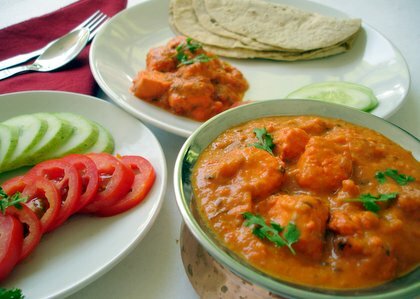 I can’t remember where and when I first tasted the Butter Paneer Masala, but when I explained the dish for Indian friends they immediately understood what I had eaten. It’s chunks of cottage cheese (paneer) in a red masala. Of course I wasn’t able to enjoy it fully in the start. I simply left out the paneer…. I sort of didn’t like the texture… it felt swampy. But the masala is heavenly. It’s very rich (feels very fattening), and one portion + some rice is plenty for me – as a dinner. The dish is made of things I love; tomatoes, onions, tomatoe pure, chilli – and other spices (butter and cream -sigh -). At last I can enter a restaurant in India og order food with some dignity! And I know where to go first when I arrive in Mumbai in November; The Delhi Darbar in Colaba. They serve fantastic Butter Paneer Masala! Along with some rice and naan bread it should keep me going for 24 hours. Even this dish tastes very good at Indian Tandoori restaurant in Stavanger! 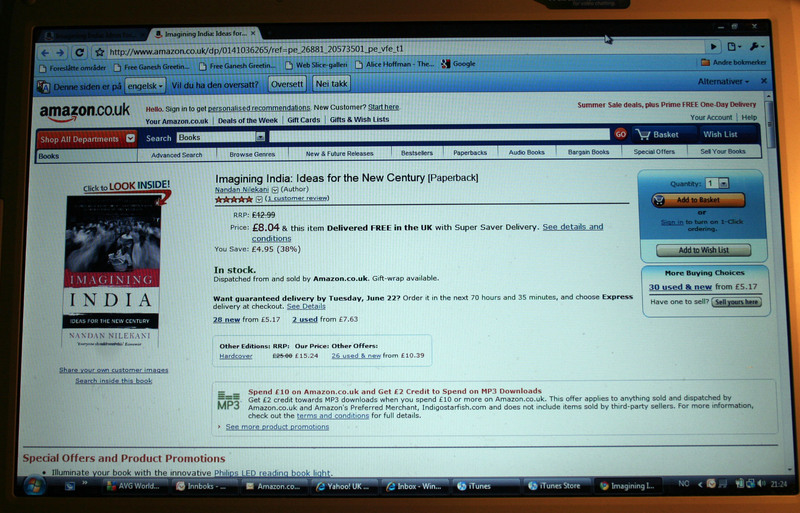 Although I’m now fully able to enjoy at least one Indian dish, I won’t let Pizza Hut down…. because if you’re in need of quick food, and if you might be a little home sick when it comes to food – pizza from Pizza Hut is a very good choice in India. But be sure to order the ones with chilli….! 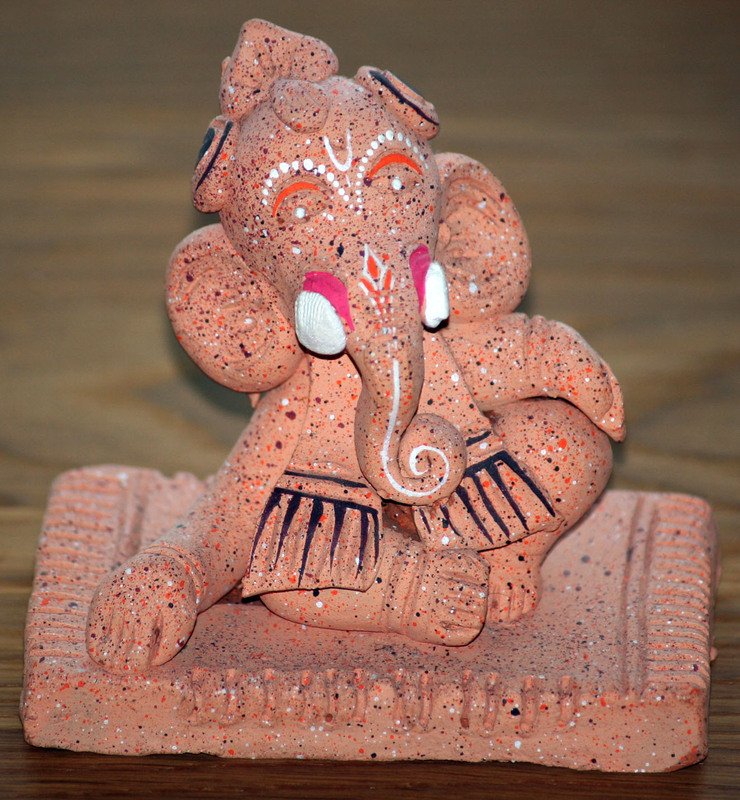 My first Ganesh, or Ganesha, was bought in the Sarasbaug Ganesh Temple in Pune, south of Mumbai. We went there together with our friends Girish, Sanjay and Mandar a few years back. 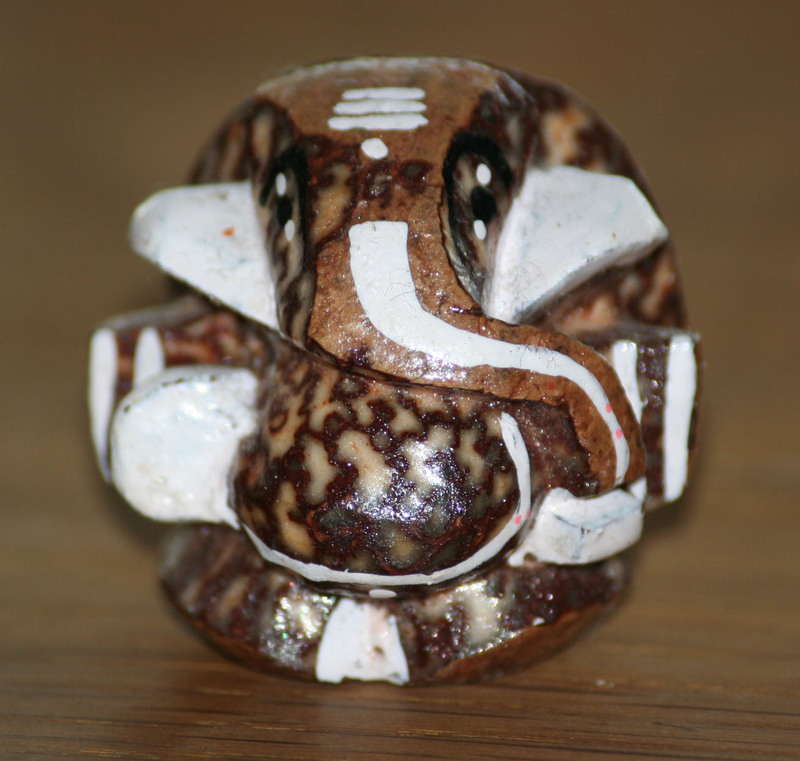 It’s a small Ganesh, tiny, probably made of beetle nut. I thought it would represent a good memory from a nice day! My very first Ganesha... bought in Pune! 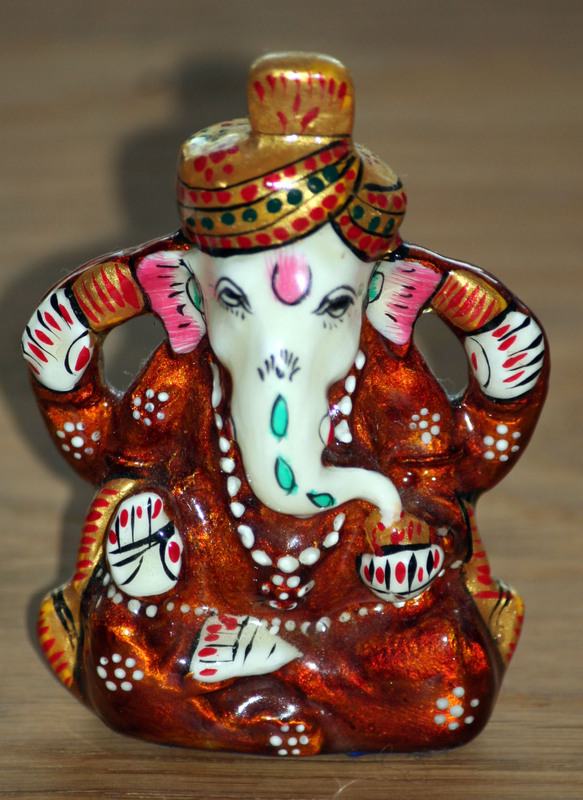 Ganesha is one of the most popular deities in the Hindu pantheon. 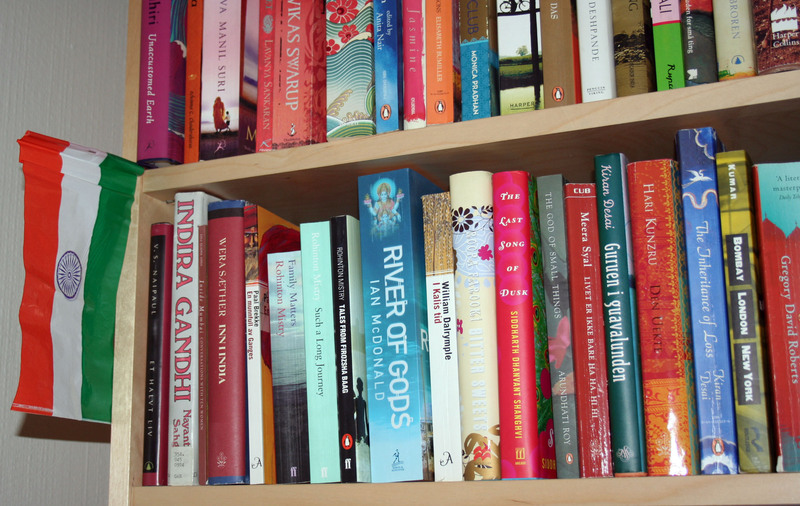 He is closely associated with the daily lives of millions of Hindus even today. As he is reputed to be a remover of obstacles he is propitiated before the beginning of any new venture whether it is the building of a new house, the writing of a book, the beginning of a journey or the starting of a new business. 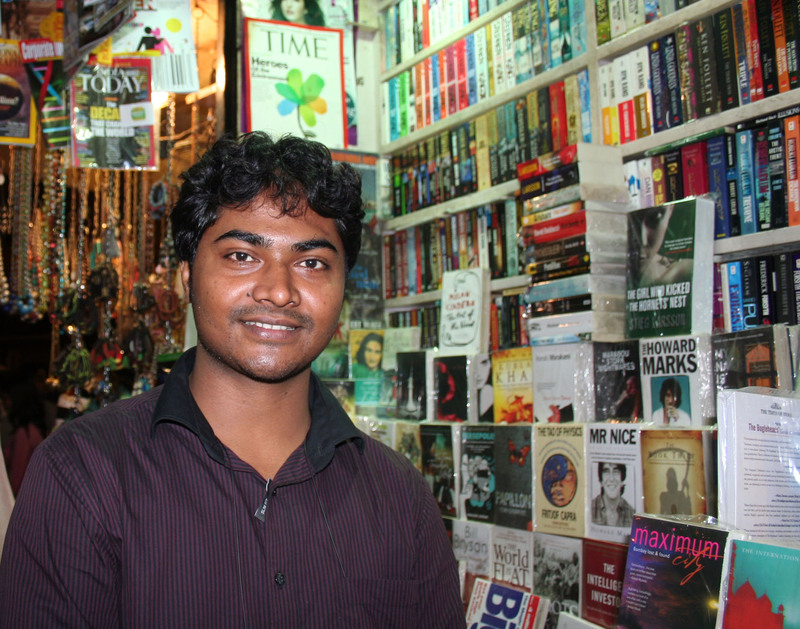 His images adorn the walls of innumerable business establishments across India. 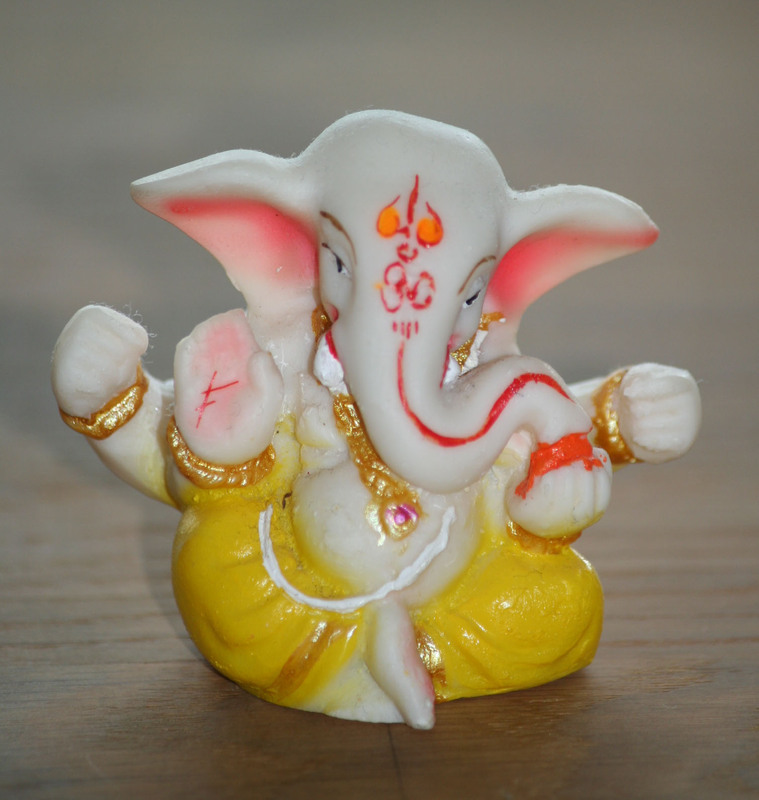 Ganesha is also the God of wisdom and prudence. My second Ganesha is the one that looks like marzipan. I feel like setting my teeth in it….. It reminds me of our nicely decorated Christmas marzipan! This one I got from Fadderbarnas fremtid, a small reward for having recruited new sponsors! If Norway has trolls, India has Ganesha…. At least in some places. In Colaba causeway, Mumbai, the pedestrian market is full of this figure. In every size and material. You easily get hooked. Ganesha is represented as a short, pot-bellied man with yellow skin, four arms and an elephant’s head with only one tusk. In his four hands he customarily holds a shell, a chakra (discus), a mace and a water-lily. His unusual steed is a rat. 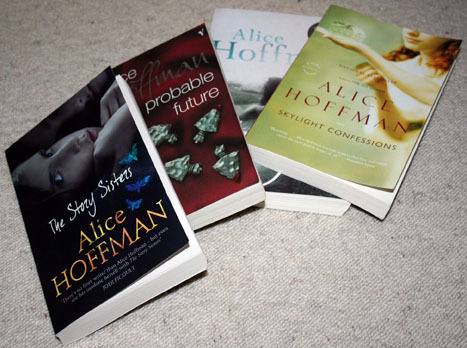 Although not every copy includes all this. Last year, I bought several items. 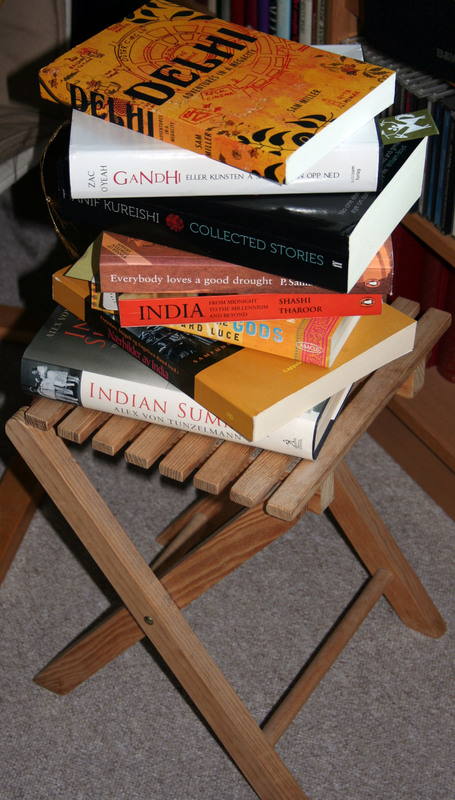 I remember a shop in Colaba. I remember it because the shop assistants seemed so dull and depressed. They didn’t seem very interested in the customers, and almost every item was on sale. I felt I had to buy something, as some sort of support… Maybe I was wrong. Maybe they were all having a bad day and couldn’t care less about customers. But I bought a couple of silk paintings, they cost next to nothing. Two elephants and one Ganesha. This one has a turban, or so it seems. Mr Ganesha Singh?? At birth, Ganesha was a perfectly normal boy, with perfect features and body parts, as befits one conceived by a goddess. How he got an elephant’s head is another story.Or, several stories, so it seems…. 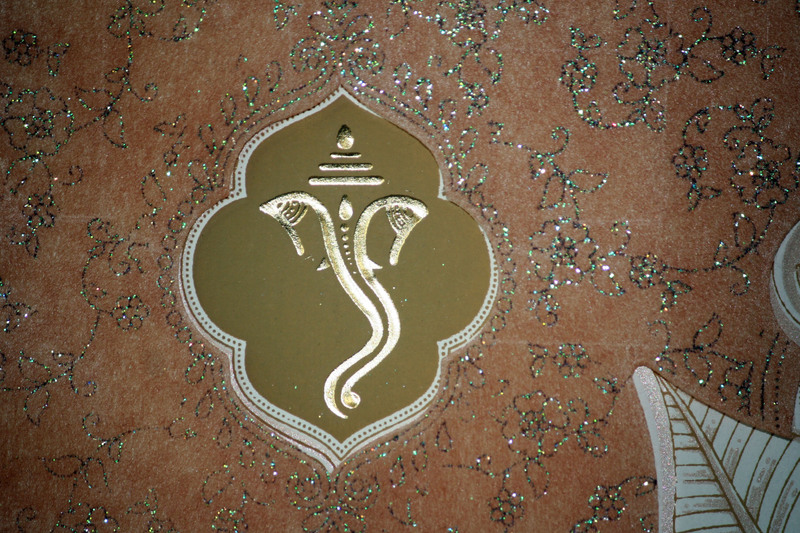 Wedding invitations in India are very elaborate, and very often comes with the image of Ganesha. A new start in life… The photo below is not from a wedding invitation, although I have a few now now – but it’s a card from a young girl I met in Raigad. I have never been able to put the card away. I like the way the head is depicted! 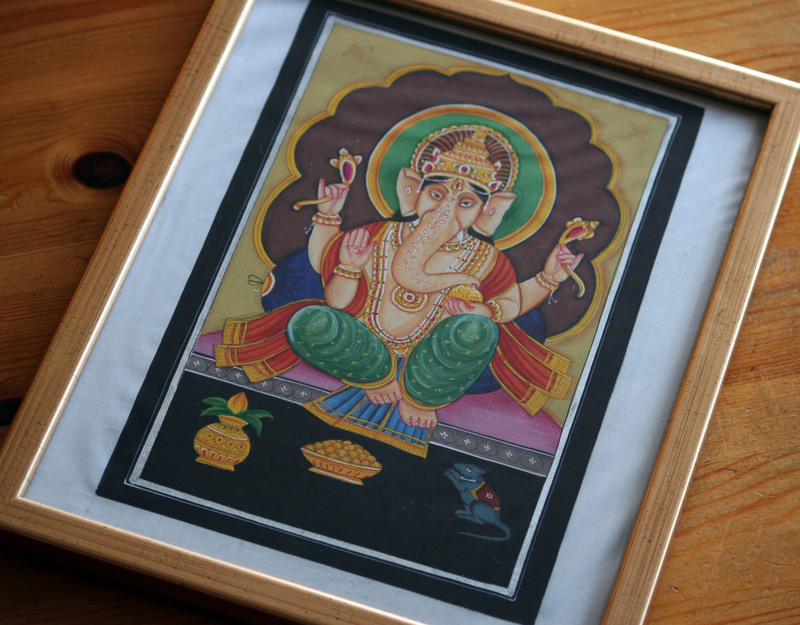 My favourite Ganesha is still to be bought, but I have an idea where it might happen. 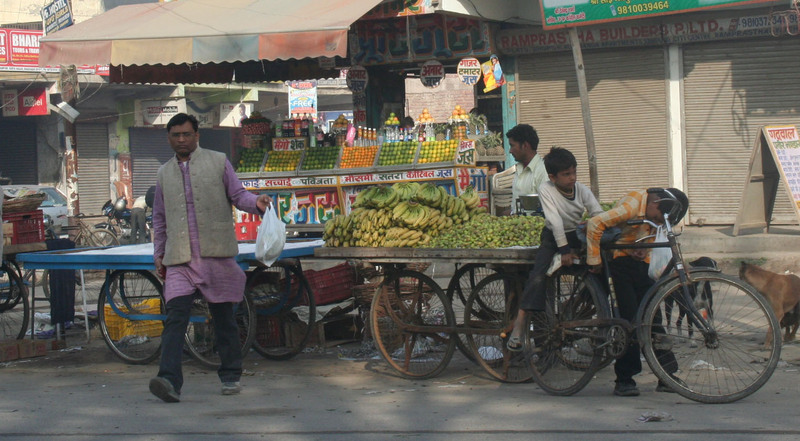 It was our dear friend and travel companion Ram who told one of his friends after our trip to Uttaranchal in northern India last year: I have never seen anybody eating so many bananas…. 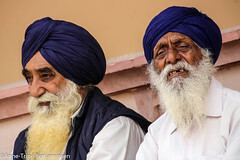 Anybody was Asbjørn and me, on the road from Delhi to Gethia and return. Ram and driver Rana were in the front seats, whereas we were stuck in the back, squeezed in on each side of a suitcase that never would fit in the trunk, two rucksacks, my handbag, a camera bag, water bottles… it’s amazing how you NOT travel light when you have a car at hand. Yes, and bananas. One plastic bag for the fruit itself. Another one for the peel. This eating obsession had its obvious reasons; Asbjørn is always, when in India, fearing the Delhi-belly. Whereas I always fear starvation, – because can you trust finding a Pizza Hut in the countryside of Uttar Pradesh? Anyway, Ram was hunting bananas. Not that they are hard to come by. And we were eating them in between all other meals, who turned out pretty decent! But it’s always good to be on the safe side! Ram has been shopping bananas…We’re on the road again! 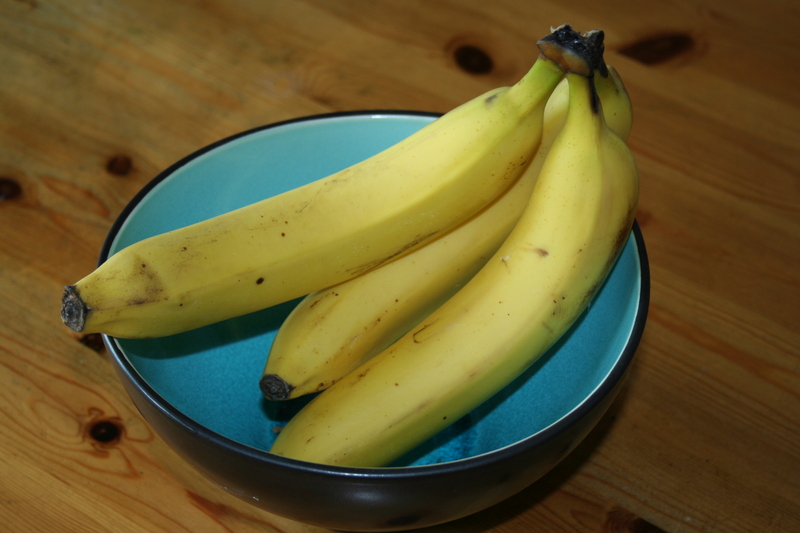 Bananas work instantly when you’re hungry. Praise the banana! Recently, I decided to test myself and my willpower, the idea was to lose enough kilos to NOT have to buy new clothes (environmental initiative). Insted I wanted to make use of those clothes who had shrunk in the cupboard. Easy? no. Possible? surely. But now we’re talking starvation! Breafast has been meagre for a while. 40 grams of Kellogg’s AllBran. 1 decilitre of skimmed (!) milk. 1,5 dl of orange juice. One (!) walnut. End of story. And well yes, a cup of tea. What a treat! Next, bike for 5,5 km. And then my new obsession; the treadmill in the gym at work. 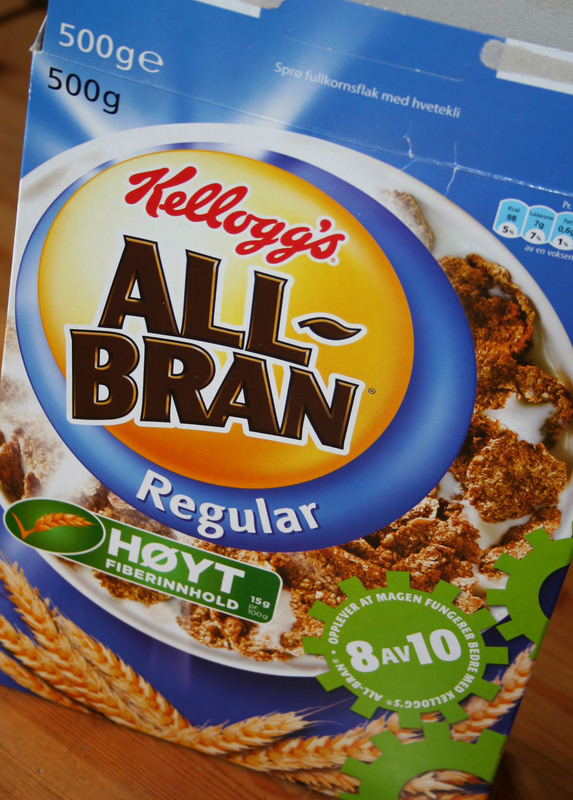 AllBran looks like cardboard, but taste quite yummy – and has all the right words written on the package – fibre coming out as king…. As I haste away, I hear all my cycling colleagues click-clack on their biker’s shoes enter the gym, walking from the locker room to the wardrobes. And I know some of them are thinking, what’s she up to…. (because some have asked). After 20 minutes, sometimes a little more because I like my own selection of music so much, I enter the wardrobe, remove the inner layer of clothes, take a quick, proud look at my tomato red face and enter the shower. But – what has all this got to do with bananas? Thing is, when I enter my office, after pulling life into my computer, after getting coffee and water, I suddenly realise I’m totally starving. The 40 grams of AllBran has been burnt away, every bit of fibre and God-only-knows-all-the-healthy-stuff has disappeared. And lunch is at least three hours away. I imagine that the coffe is a healthy filling syrup and that the water contains some anti-starvation bubbles. And you can really make your imagination work for two hours! At 10 am I grab my banana, eat it, comes completely to life once more and top it with another coffee and look forward to 200 grams of salad for lunch. Life can be tough at times…. but the banana makes it work!